Thank you for your interest in Rokuhan products. We will deliver S037, "Digital Turntable" soon. 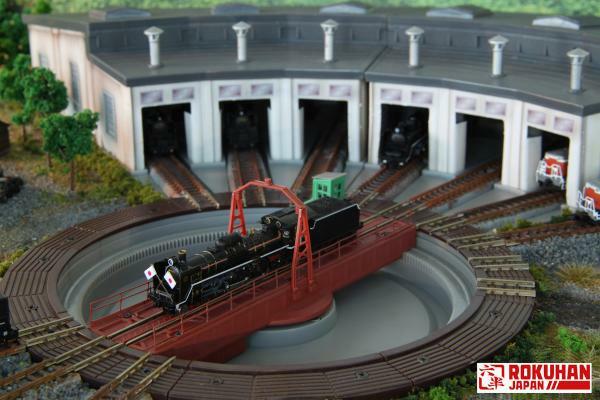 *It is a motorized railway turntable which can be set into your layout. *It is used digitally controlled stepper motor, so can be fixed turntable position accurately. *Turntable turns clockwise or counterclockwise direction and rotate 180 degrees by press button for few second. *It can be connected with Rokuhan C005, e-Train controller, then you can operate it by smart phone or tablet. *The turntable cabin is removable. *S038, Round House ( one or more), are the best fit with S037 Digital Turntable, if you use only S037 Digital Turntable. *Required A028, Rokuhan AC adapter, when connected S037 Digital Turntable. *Not required A028 Rokuhan AC adapter, when connected S037, Digital Turntable, with RC03, controller, or C005, e-Train controller. *The A036 extension cable may be required, if you set this on large layout. Note: A028, A036, RC03, and C005 are sold separately. Please make reservation for S037 Digital Turntable at nearby Rokuhan hobby retailer. *All appearance and specifications subject to change without prior notice.